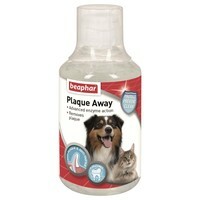 Beaphar Plaque Away is a hassle free oral care solution, containing Chlorehexide, specially designed to ensure that your dog or cat has fresh smelling breath at all times. The solution is an effective treatment for gingivitis and helps prevent dental disease by reducing plaque and bacteria formation inside your pet’s mouth. An easy to use and effective Mouth wash with fast working results! Simply add 10ml to every 1000ml of the cat or dogs drinking water on a daily basis. The Beaphar Plaque Away is great for pets that aren’t used to having their teeth brushed, making theirs and your lives a little easier.